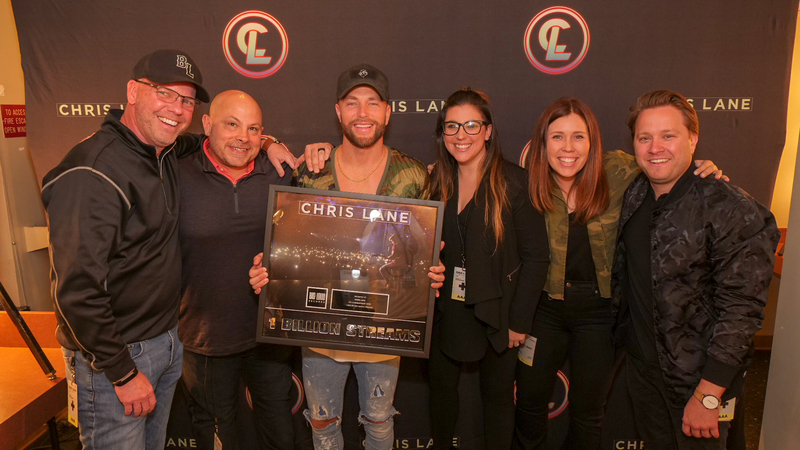 Big Loud's platinum-selling star Chris Lane hit a milestone this week, surpassing one billion career streams. The hitmaker was surprised by his team backstage with a plaque to honor the occasion, right before taking the stage in Seattle as direct support for Dan + Shay. Lane's latest single, "I Don't Know About You," is racking up views and streams. The video has nearly 30m views, earning the most viewed Country video on Vevo for multiple weeks. The track is headed toward 170m streams and has entered the top 40 at Country radio. Pictured above giving Lane the plaque treatment: (L-R) Big Loud President Clay Hunnicutt, Director of Promo (West) Dave Kirth, Chris Lane, Big Loud VP Promo Stacy Blythe, Director of National Promo Ali Matkosky and Big Loud Manager Marc Rucker.